Data graphics open up wonderful opportunities for communicating. And Quicken 2012 charts are really easy to use. 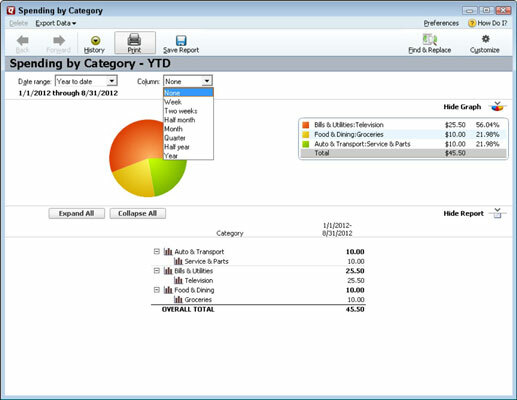 In fact, many times, Quicken will add a small chart to a report window. You can also display just a chart, however. To produce just a Quicken chart, first produce the report you want and then click the Show Graph button that appears in the report window. That’s it. Easy as rolling off a log. Note: Not all reports provide data that can be plotted in a graph. Accordingly, you won’t see a Show Graph button in every report window. Here is a picture of a bar graph of income and expense figures, but you’ll have much more fun looking at your own data in a picture. By the way, you can drill down through a chart to see a report that describes the data being plotted. You can memorize customized graphs the same way you memorize customized reports. Just click the Save Report button at the top of the graph window. Then, when Quicken prompts you, give the graph a name. 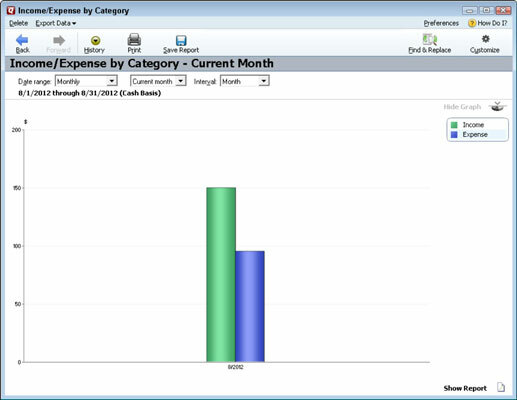 To later reuse the graph, select the graph from the My Saved Reports section of the Reports & Graphs Center.